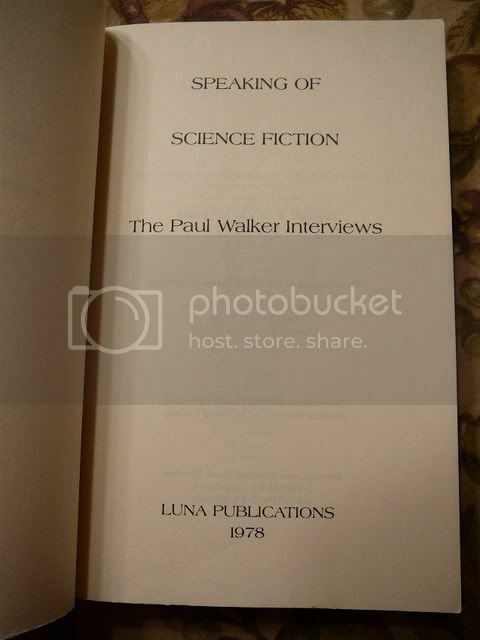 This is a trade paperback sized book of interviews by Paul Walker, published by Luna Publications in 1978. There is also a hard cover edition. This book contains interviews of many of the great science fiction writers and I'm so very glad that Anne McCaffrey was included! Each interview is accompanied by an illustration by David Ludwig and I'll include a few of those interesting interpretations in this post also! The interviews are about what it is like to be a science fiction writer, why they write, how they write and what they write about. It's also about the kinds of people they are. They were conducted by mail, which I found interesting. I'm only going to list the last names of the authors included in the book because there are a lot of them. Lafferty, Le Guin, Farmer, Simak, Lieber, Zelazny, Schmitz, Laumer, Anderson, Asimov, Pohl, Gold, Knight, Carr, Campbell, Moorcock, Blish, Russ, McCaffrey, Norton, Henderson, Silverberg, Ellison, Bester, Brunner, Bloch, Tucker, Hamilton, Brackett, Williamson and Aldiss are all included. I'd met a young fisherman, English by birth, 23, blue-eyed, blond-haired, built like young Apollo, my friend as well as my sons'. Two houses over from his digs is a boarding house where David Gerrold took a flat while he was here in Ireland. It was Dave who told me that his landlady (an ex-show jumper and pony trainer) reminded him strongly of Lessa. When I met the gal, she sure did look like Lessa - a small frame (roughly 100 lbs in full clothing), a vibrant, sometimes violent, personality, and a 'cloud of dark hair'. When she read Dragonflight, she agreed that she was in many ways 'Lessa'. 'Far more than I'd like, Annie', she said, almost ferociously - as if I'd more or less(a) been inside her brain." Anne continues by saying that the artwork by Betty Ballantine was a shock, for the cover for Dragonquest. She says, "There on the cover, in New York City, big as life, was my fisherman. 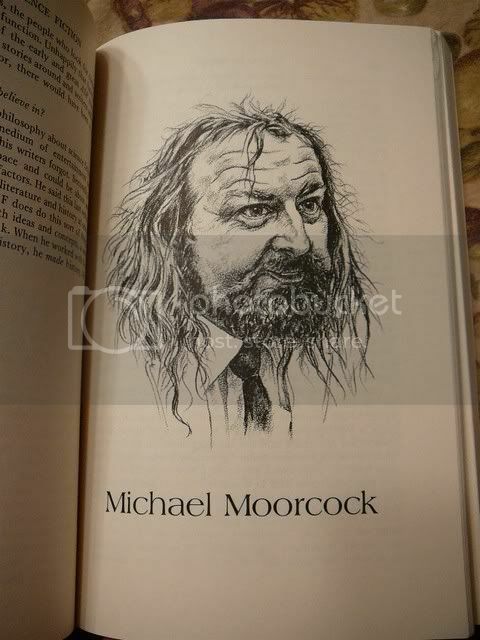 I've got a snapshot of the man in the same pose as F'nor and likeness is uncanny. Mind you, the artist was American, hadn't heard of my fisherman at all. The difference is superficial for F'nor is brown-haired, hazel-eyed. Also, the resemblance wouldn't be so startling if the fisherman were a nine-to-five clerk or if my Lessa were just a housewife, but tempermentally the two are suited to the roles in which I'd already placed them - the dragonriders of Pern." I'd heard about this before, F'nor and Lessa being 'real' people, but hadn't heard any more than that, so this little bit of information made me smile. He also asks Anne if she was asked to interview herself what impression does she make on you? What does she look like and sound like? 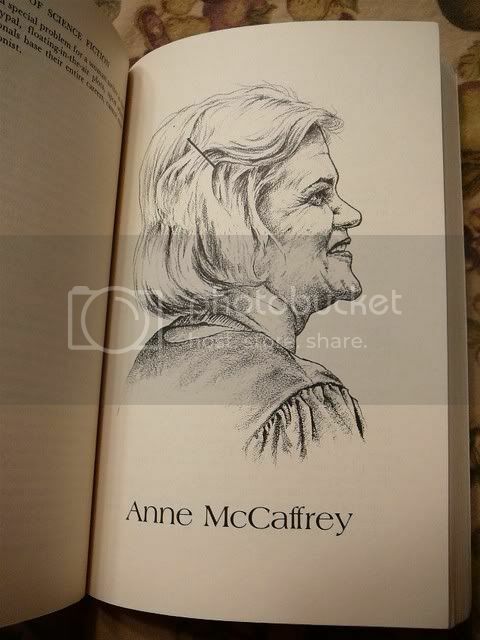 Anne responds: "Well, if I were assigned to interview Anne McCaffrey, I wouldn't want to go because I hate to take interviews and I hate women authors who are successful. No, I don't. But you put me in the position of being objective about myself which is DEATH. I mean, I take a good look at myself in the mirror, then forget it. Ain't you got on sense at all? Making all my muscles fall? What you see when you first meet me is a tallish woman with silver hair usually slightly mussed up, with her lipstick half-eaten off, usually garbed in her number one son's cast-off jeans, worn out loafers, and whatever shirt happened to be clean; someone who would probably come out with unexpected remarks to confuse you and then offer coffee or tea or something to eat to put you at your ease, and then continue to do what was expectable." Something else that made me smile when I read it. And it's Anne to a T! I'm not going to include the entire interview, but wanted to give you all a sample of it. It's worth the purchase price to see the illustrations! What a wonderful, wonderful book and what great drawings! A true treasure. Thank you for this highlight Becky. I didn't even know this book! Only a snippet of an interview but... I think it's published elsewhere, too and think I've read it without even knowing about this book. Ah, of course in the Luna magazine! Yes, I'm sure Luna magazine has this published in it also. I found this particular book a long time ago, way before I ever got hold of a copy of Luna. I was just looking for the hard cover and pretty pricey!! I think I'll be satisfied with the paperback. OH becky this is truely a fantastic find and wonderful reading what you wrote about it...very nice job. I love the art work, and will of course have to find one of these for my own collection, as I will really want to have that portrait of her. Last edited by Lady Maelin; Jun 23 2008 at 11:12 PM. Oh yes, love this book. And yeah, the interview is printed elsewhere, not that I could tell you where. Nice, find Hans! Well read more later, for I still have work to finish yet! I went on eBay and ordered the hardcover of this book yesterday! It's from the publisher and they had not only a buy it now, but a best offer. So I offered $15 and they took it! Can't wait to get my copy! 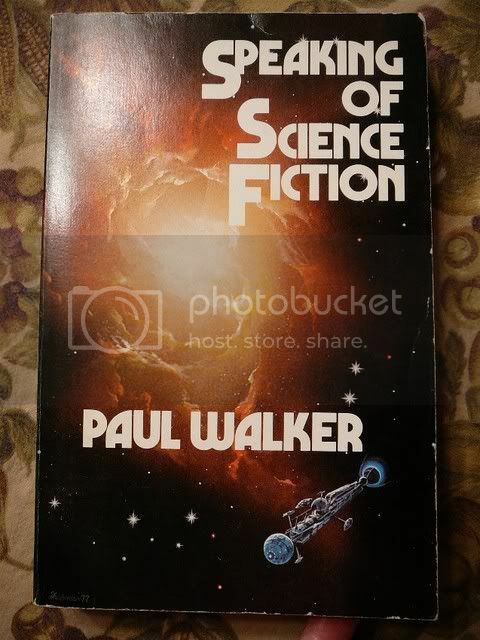 They published only 100 of these books in hardcover, so a rare item indeed! Thanks Hans for finding this book in hardcover! And I'm glad I finally remembered to look for it. Where does it say that they made only 100 copies? Congratulations Becky ...I'm glad that you finally remembered to go and look for one...seems that you not only found one...but at such a fantastic price...way to go! ! Hans - I sent them an email asking a couple of questions about it and they responded that they published the book and made only 100 copies. you've added very nicely to your collections by doing that very thing... .
LOL! You're very right about that Maelin! I have gotten a few nice things by just asking a question or two. My mother always told me that it never hurts to ask questions and the worst thing that could happen is someone might say no. While I have been told no quite a bit, I've also been very fortunate and had lots of fantastic yes replies! My copy arrived today! Still inshrink wrap and brand spanking new!!! Thanks again, Hans for finding this book which helped me find my copy! Thanks Maelin! I'm pretty happy to see it since I didn't think I'd find one, much less than still in shrink wrap. Yes Becky, I took it out At work now, will post the data later. I would take it out, have always done so with shrink wraps books. Who knows what else they may hold, like a message to the author I once opened an old book that had a letter in it from Virginia Kidd, Anne's agent. That wasn't shrink wrapped but had it been, I would have missed that! Aprt from the practical side there's some special feeling when opening a shrink wrapped book I know you feel it too, Becky, as you once said the same. Just unwrapped it! Nothing spectacular other than the satisfaction of removing it from the wrap and being the first person to open the book! The spine crackled as I opened it just enough to remove the dust jacket and put the jacket in a cover. So it's not even been opened fully. The publication info is the same as for the paperback, by the way. Becky...glad to hear that you did open it up...other wise it wouldn't have truly been yours...it would have just been a book in plastic wrap that you paid for. Now you can give a true place on your book shelves...and you never know you might find some other interesting reading it now. You are so correct, Maelin! It is truly MY book now that I've taken the shrink wrap off. I offererd 10$ and accepted the counter-offer of 15$. Yes! Thanks to you two! Will we see a MoM-Book-Run? Dernok...Congratulations on finding and purchasing one of these... and what hopefully is a decent looking edition, for a good price. Dernok - great purchase! I hope you enjoy the book, I have been. It would have been an even better purchase if i found the Lehmanns offer before i bet on and got the paperback on ebay, too. Combining shipments overseas doesn't seem to bring the same benefits as here on the continent. Actually i pay more for shipping (27,90$) than for the two books (22,50$). Yep, that shipping can be nasty. Sorry it didn't work out so well for you in that respect. Holy Cow Dernok ...that sure would take a huge bite out of my book budget , and it sure wouldn't help when your trying to build a decent collection. Sorry you are having to pay so much for the shipping. Even here in the States, our mail prices have gone up...not anything like your cost...but non the less its not fun to find a book and have to pay so much to get it to you. At least e-Bay gives you the p & p costs before you bid. I'm not complaining about ebay. Nor the seller. I'm a bit angry at myself for making two mistakes in a row. First failing to check if i could get that paperback elsewhere for less or zero shipping costs and second for "assuming" and not making sure that combining shipments will result in a major saving. p.s. : On a more general approach i _could_ complain about the seller. Almost all overseas sellers only offer shipment via air. Which is not only more expensive than transportation via surface (aka by ship) but also a lot more damaging to the environment. Last edited by Dernok; Feb 14 2009 at 06:07 AM. Reason: Added p.s. A friend of mine ordered a book and it was coming from Texas to where she lives in the US. So no big deal right, why have it sent special? Well, one would think so anyway. She went over a week without the book showing up in her mail box. She contacted the seller who said it had been shipped and to give it a few more days. She did....a week.... and still no book. The seller asked her to wait a full month. She wasn't happy but she did. Still no book. She ended up with a refund from the seller. She was very disappointed with the transaction not knowing whether the seller just didn't have the book and thought they might find a copy to send her....you know the usual nightmares you have about things like this that happen. Well....almost 6 months later the book arrives on her doorstep!!! It had gone clear around the world! It had postmarks from all over on the packaging! 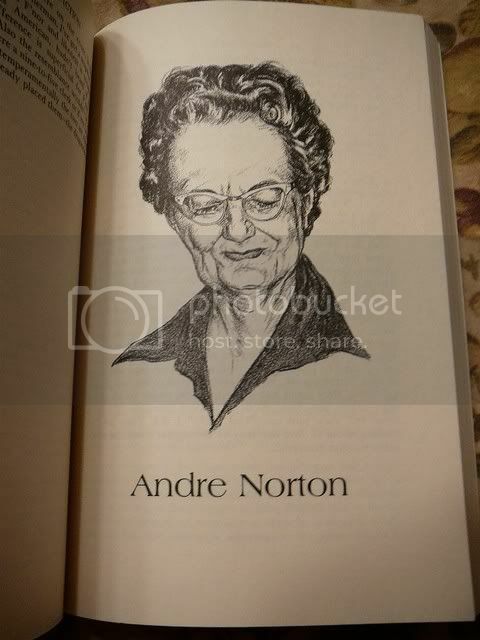 She did contact the seller and paid for the book. It is one of her favorite books because of it's global journey. I don't think much harm was done to the book, if any....a testament to this seller's packaging! Who's to say if she'd paid for Priority shipping or something other than regular first class mail (surface) that she'd have gotten the book in good time right off, or if this book was destined to go globe hopping. I do prefer air when I order a book from overseas, just because of this story. It still may go awry, but I think the odds are better that it will make it to me without much frustration.